HAPPY THANKSGIVING!! It’s that time of year again, feared most by turkeys and loved by gourmets and gourmands alike. Thanksgiving has got to be my favorite holiday. It has all the festiveness of Christmas without the worry and stress of giftgiving. This year, we are turning to our traditional Southern menu with a touch of Filipinoness. As you will note, Turkey is the only main dish. It’s Thanksgiving after all. Some people will add a second or third main dish, like ham or fish, but we feel the turkey should have front center and top billing. I will probably add a couple of new, experimental (my kids hate this part)dishes but I haven’t figured out what yet. Click on this link if you want to brine your turkey first. Pingback: AMoores » Happy Thanksgiving! Pumpkin flan, hmmmm. Sounds interesting. Brussel sprouts is a no no on my table, hehe. Wow you cook all those stuff? How I wished I was there at your place munching all those goodies. Anyway, Happy Thanksgiving to you ate! WOW! 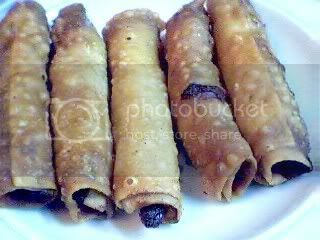 That lumpia looks especially yummy! I had a very Filipino Thanksgiving last year, which was delic. Happy Thanksgiving!!!! Thanks for the tons of ideas. I am exempt this year from Thanksgiving and Christmas prep because of my vacation to Canada, but your list is one I can refer to when the need arises. Hi sean, I just checked out your blog. How awesome to have a whole blog dedicated to thanksgiving! I printed out your pumpkin pie recipes. Turkey is the main course on Thanksgiving…and i just love turkey….your dishes look great nd they are making me drool…and hey for some interesting resources on Thanksgiving be sure to check out my Thanksgiving Blog sometime and enjoy all that’s there…have a great Thanksgiving!! !